For December's HuffPost Alberta Photographer of the Month, we turn your eyes to the night sky and the gorgeous aurora borealis often visible this time of year. Calgary photographer Christy Turner has been chasing the northern lights for several years. Her patience, combined with well-conducted research about when auroras will occur, allows her to capture the dancing skies at their most active. Christy was kind enough to answer a few questions and share some of her images with us. Q: Where did you grow up and where do you currently live? A: I am a born-and-raised Calgarian. Calgary has become such a dynamic city full of constant opportunity, I always end up back here. I lived almost seven years at sea, and part of that time in Southern Italy but always pined for my Alberta mountain air. Q: How long have you been shooting photos? A: I worked a large part of my earlier career at sea, managing IT systems while travelling the world on cruise ships. I started taking photos in all the ports I visited, and in retrospect, could kick myself now for not spending all those nights in Alaska staring up at the sky! I was given so many years of opportunity to be in so many places in my life that it is only natural I would want to immortalize these sights on film! Q: What about Alberta inspires you? A: The energy found here, and I don’t just mean our abundant natural resources. The fact that no matter how big our cities grow, you still find wonderful genuine people with similar love for our country and it’s beauty. The incredible Rockies, the Badlands, the world-class national parks in our province, and even the pristine, frigid beauty of winter in northern Alberta — I just feel so very fortunate to be living in such a safe, scenic province. Q: How patient do you have to be to photograph aurora borealis? A: Extremely patient, and extremely vigilant. To be privy to the best shows, the moment the science and data line up, you have to be prepared to jump in your car with your gear, and drive a significant distance out of town to capture these displays of the night! Of 10 separate outings to catch an aurora, I might have four to six actual shows, and sometimes it feels like it’s just for me. Q: What's something photographers who shoot at night have to worry about that photographer who take photos during the day don't have to? A: Low-light photography requires very specific settings and lenses to be able to fully capture the detail and pillars of the aurora displays. Things sound scarier at night — I have a very vivid imagination and it adds a certain element of spookiness, or excitement to be surrounded in dark prairie night. I’ve been confronted by cattle, large farm dogs, and even a skunk! A: There are moments where you simply have to stop shooting and just take a step back and stare at the incredible sky. As for seeing Aurora substorms exploding with curtains of light above your head while standing in some farmer’s field, well, there are no words for that! It’s always unique, and there are pinks, greens, purples, reds, and blues! A: Generally, I try to bring a friend along, and part of the reason I bought the car I did is because it had a sunroof. If it’s particularly cold or windy, I can wrap a tripod around my roof and shoot from the warmth of my car! Only last week during an aurora hunt did a large dog come out of nowhere and scared me so badly I almost dropped my camera on the icy road! Q: What's your advice to people who want to learn to take remarkable photos of the northern lights? A: Don’t count on just one app or website, use multiple sources. Take the time to learn the factors behind auroras. 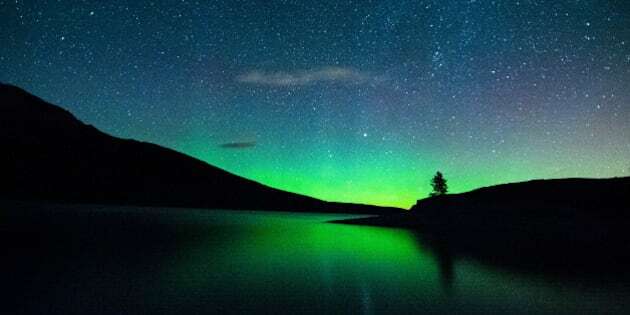 Draw upon the various interest groups in social media to find others in your area interested in the science behind tracking the aurora borealis. I’ve learned so much from my peers, and there is much still to know! A: Travel has been such a huge part of my life, and continues to be. I try to travel to a couple major international destinations each year and take several smaller trips — all in the name of photo opportunities. Next trip planned is a photographic safari in Kenya January 2015. I also love spending time with my nieces and nephews, following space weather conditions, admiring the work of my fellow Alberta aurora chasers and working on writing projects. The most amazing experience I’ve had with the aurora is seeing a lengthy show while flying to Europe in October this year with my mother to Paris. I knew there was a possibility of a display, and chose my seat accordingly on the side of the plane that faces the arctic circle. About 3 hours into the flight the skies exploded with pillars of green, at times seemingly covering the plane entirely. It was magical. My photos I managed to take that night consisted of propping my elbow on my tray table and holding my breath for 20 second exposures praying for no turbulence. I landed a pic on the cover of spaceweather.com — a real coup for science nerdy types like me! Whether I’m photographing the Northern Lights or a beautiful new destination, I shoot entirely for myself, defining myself and my outlook on the world. The fact that these photos seem to resonate and connect with other people is simply amazing to me, and such a bonus! I’ll never tire of this pursuit of these elusive, magical lights of the night!